Holiday Cravings Filled – Fast! Craving a holiday treat, but hate the hassle of baking? No need to dig out the rolling pin and cookie cutters – your favorite fast food restaurants have you covered. 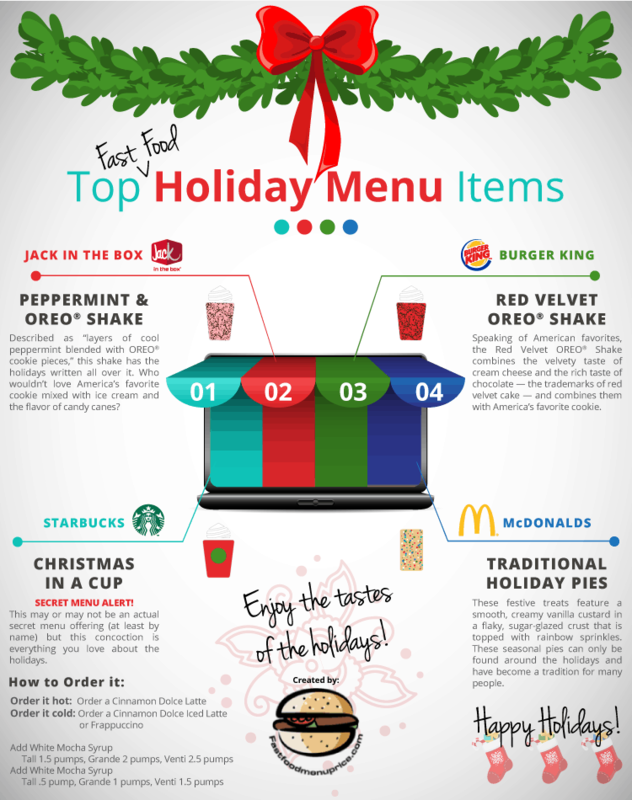 With so much spending during the holidays, these fast food menu prices are hard to pass up. Plus, the convenience of the drive-thru window is just right for the most wonderful (and busiest!) time of the year. Fuel up for a long day of holiday shopping with one of these four deliciously convenient treats. This secret menu item is sure to satisfy your sweet tooth. Christmas in a Cup can be ordered hot or cold, so you can get your yule on regardless of the weather. Warm up by ordering a Cinnamon Dolce Latte with White Mocha Syrup (1.5 pumps for Tall, 2 pumps for Grande or 2.5 pumps for Venti). Or, cool down with a Cinnamon Dolce Iced Latte or Frappuccino with White Mocha Syrup (.5 pumps for Tall, 1 pump for Grande or 1.5 pumps for Venti). Now sit back and sip on that sweet holiday cheer! Head to your local Jack in the Box for all the minty, chocolatey goodness you can handle. If you thought Peppermint Oreos were tasty on their own, just imagine them with ice cream! Mint and chocolate is always a winning combination, and this chilly treat promises to please candy cane lovers and chocoholics alike. Red is Santa’s favorite color, and this may just be his favorite shake. This velvety concoction combines cream cheese and chocolate with the irresistible taste of Oreos in a cool and creamy shake. We have a feeling that jolly old Nick himself wouldn’t be able to resist! Fill your craving for holiday pie without the work. These confections boast a flaky, sugar-glazed crust with festive rainbow sprinkles. Although McDonald’s only offers holiday pies one time a year, the creamy vanilla custard filling will leave you craving them all year long.